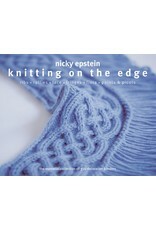 SP Knitting On The Edge - Soft Cover - Crochet Stores Inc. The now-classic collection of 350 edgings, borders, and trims by acclaimed designer Nicky Epstein is available in paperback! Taking the traditional rib to new heights, Nicky features improved ribbed edges, ruffles, lace, fringes, flora, and garters. Line-by-line instructions accompany each of the stitches. Decorate cuffs, customize a sweater, and develop unique patterns using ideas such as the feather lace ruffle, bel epoque, garter stitch weave, sea scallop edge, and sugar drop.